Enjoy spectacular view in the fjord side cabins. Experience Lyngens newest attraction! 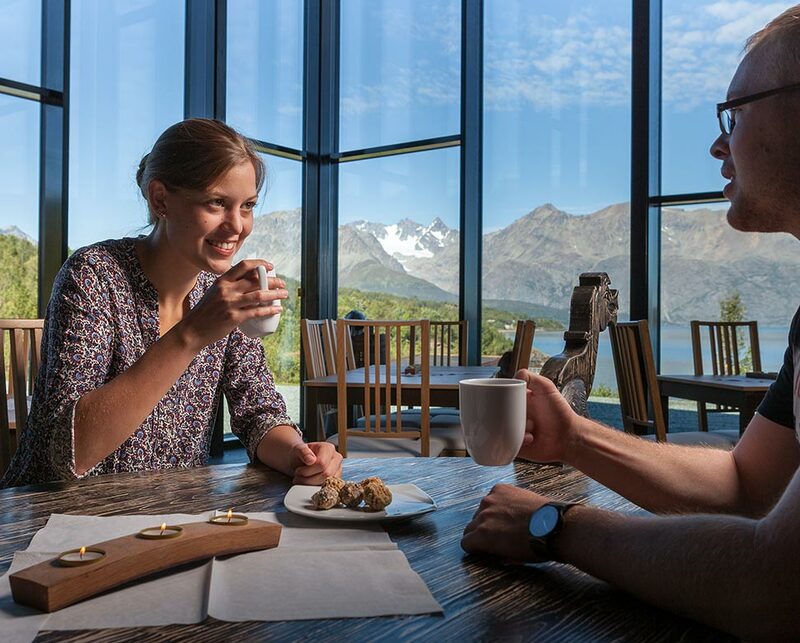 With spectacular view towards beautiful Årøya and the «golden row of the Lyngen Alps», we offer a completely different setting for conferences and meetings. In addition to view and facilities, we offer exciting and interesting experiences, local food and products, handmade between fjords and mountains. Aurora Spirit Distillery offers modern facilities for meetings and conferences. We can host everything from board meetings to conferences with up to 50 participants. The Lyngen fjord, Lyngen Alps, views, fresh air and an exciting area will be a good frame for inspiration, good ideas and creative meetings. We can tailor courses, conference and meeting program to fit your needs and desires. All the food and snacks served at the visitor centre are sourced locally. 12.00 – Lunch –taste of Lyngen (Lyngenshrimp, whisky smoked salmon, Wild goat salami, Goat cheese, Potato salad, (milk, eggs, senapseed), Scrambled eggs. Served with glacial water. 15.00 – Guided tour –Arctic distillation experiencewith visit to the secret NATO cask storage. Souvenirglass and tastings included. 20.00 – Dinner in the Bivrost Lounge. An interesting array of local food to choose from. 09.00 – Registration and start of conference in Bivrost Lounge. (incl. Coffee, biscuits, AV equipment, WiFi). The Midgard Lounge is also avialable for group sessions. 11.30 – Lunch –taste of Lyngen (Lyngenshrimp, whisky smoked salmon, Wild goat salami, Goat cheese, Potato salad, (milk, eggs, senapseed), Scrambled eggs. Served with glacial water. 12.00 – Guided tour –Arctic distillation experience with visit to the secret NATO cask storage. Souvenirglass and tastings included. 15.00 – Break, stretch the legs in stunning nature. 17.00 – End of conference, departure home or alternatively end the conference with dinner. An interesting array of local food to choose from. 11.00 – Welcome. Lunch –taste of Lyngen (Lyngenshrimp, whisky smoked salmon, Wild goat salami, Goat cheese, Potato salad, (milk, eggs, senapseed), Scrambled eggs. Served with glacial water. 11.30 – R.I.B Lyngenfjord Experience – experience the Lyngen Alps up close, by sea (clothes and equipment included). 13.30 – Meeting time. In Bivrost Lounge or Midgard Lounge. (incl. Coffee, biscuits, AV equipment, WiFi). 18.00 – Check in to cabins, preparations for the evening program. 19.00 – Guided whisky tasting. An introduction to the fine art of appreciating the worlds most advanced liquer. 12.00 – (Winter) – Snowmobiling in Camp Troll / (Summer) Kayaking in the Lyngen fjord. The activity includes all necessary equipment, drink and snack. The cabins offer a stunning view of the Arctic surroundings, in the living room. Aurora fjord cabins are situated right behind the worlds northmost distillery. The Bivrost Lounge can host up to 50 people. Incredible view towards the Lyngen alps. Suitable for smaller meetings, group sessions ant tastings. Art by Elind Rui Blix and Macallan. Yes, we cooperate with several transport companies who can arrange transport from Tromsø, Lyngen or any other places. Yes, we work with a caterer who can provide tasty vegan meals. What kind of technical equipment do you have? In the Bivrost Lounge we have a 60″ TV with rgb, usb, hdmi and AppleTv connection. 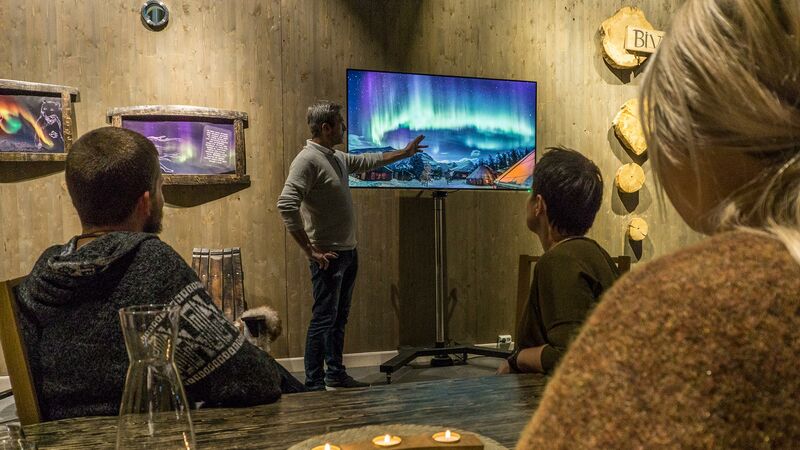 In Midgard Lounge there is a 42″ TV with rgb, usb, hdmi and AppleTv connection. There is open WiFi connection in all lounges and cabins. What kind of activities can we combine with meetings and conferences? We can arrange an interesting array of activities to spice up the event. Guided tours in the distillery and cask storage is always a favourite. 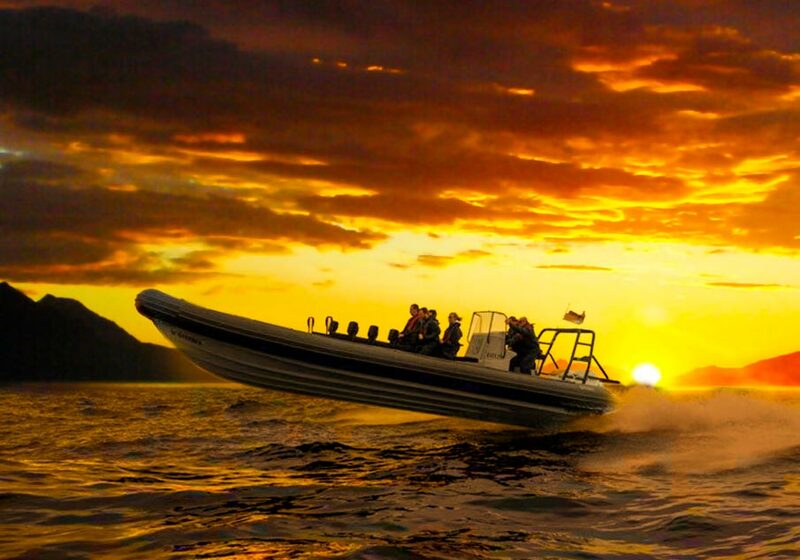 Also we can arrange guided NATO bunker tours, RIB tours on the fjord, Whisky tasting, Bivrost tasting, Axe throwing, Snow mobile and Kayaking. Ask us for special setups.